This luxury villa is fully air conditioned, equipped and furnished to a high standard in a contemporary style. It offers the perfect holiday in which to enjoy a relaxed holiday in the this gorgeous region of Turkey. Villa Sahin Dincel - 1 has been designed to provide a light, spacious, improved by marble floors to create a high quality throughout.Villa Sahin Dincel - 1 has 2 floors first is entrance floor which contains living area, kitchen and bedroom - with two single beds -. Last floor is top floor where there are two bedrooms - with double-beds-, with 2 en suite. Also all floor have their own wide balcony/terrace.Accommodation has been purposefully built to take full advantage of the stunning Mediterranean Sea views to the front & mountain views to the rear , as well as the magical sunsets from every part of villa. It is guaranteed that you will have an amazing holiday in this villa. The balconies and bedrooms are cooler in the high season, whilst the kitchen living / dining area have the benefit of direct access onto the pool terraces and garden. 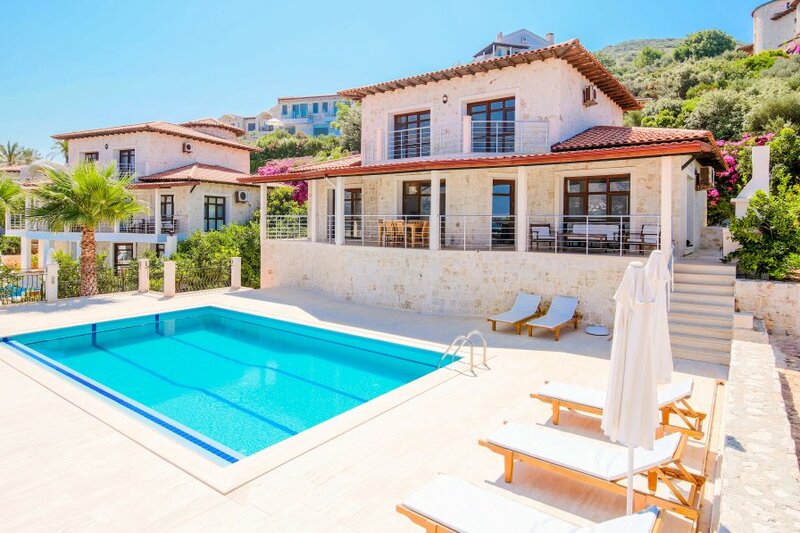 Villa Sahin Dincel - 1accommodates up to 8 people in real comfort & style.